Good morning! 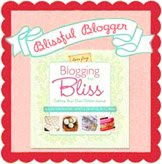 Today we're blog hopping on the Vintage Vibe blog tour! 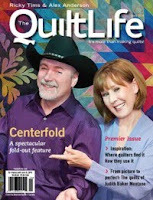 I was luck to meet Amber Johnson at Quilt Market in Houston and she asked if I'd like to participate. Luckily I was already in love with the book and said YES! There are 14 great projects in this book. 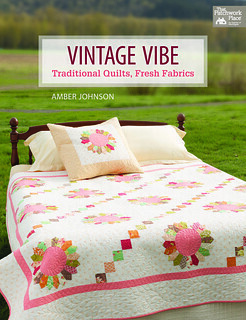 Amber includes little tidbits about her inspiration for the quilts and helpful hints along the way. The instructions are clear and concise and of course there are excellent illustrations. 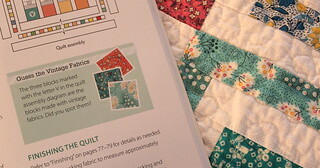 Even though I've been quilting for a long time, I find it's good revisit those instructions from time to time. My favorite project in the book is Sugar, pictured above. 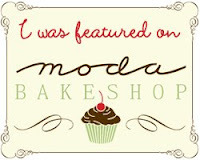 It combines a couple of my favorite things, tulips and Flower Sugar fabric! 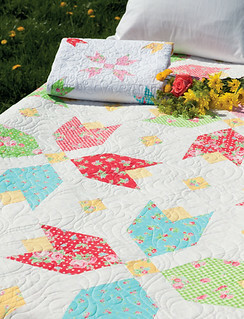 Amber has designed a dainty version as well, Sugar Sweet, as these are sister quilts, reminiscent of her childhood sharing a room with her sisters! I couldn't resist making a large Sugar block in Pam Kitty Garden! Vintage.. well that's all relative right? Amber's grandmother taught her how to quilt and in the Scrap Jars quilt pictured below, she contributed three pieces of vintage fabric for the project. Amber invites us to figure out which are the vintage pieces. Holy cow. I'M VINTAGE! I made a quilt with two out of three of those pieces! It was easy to fall in love with this book. Lots of great projects. If this is your first stop on this blog hop, I encourage you to head over to Amber's blog for the schedule so you can catch up! The list of bloggers and the schedule is here. You can order a book from Amber here, or from Amazon here. Thank you Amber for inviting me to hop along and sending me a copy of your book! Congratulations! 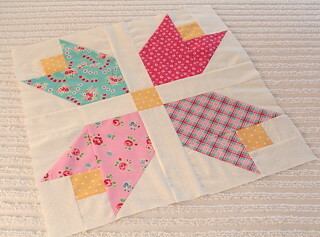 Love the 'sugar block' in your fabrics! I've really enjoyed seeing all the different patterns in the book on the blog hops. 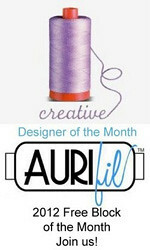 Would love to make the jar pattern with your fabric, Pam!Hmmmmmm! 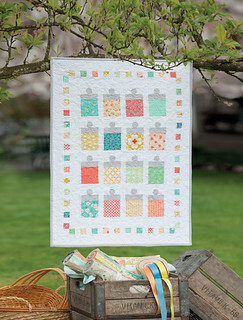 I love the sugar block with your PKM fabrics, it would make such a cheerful quilt! Thanks for sharing. 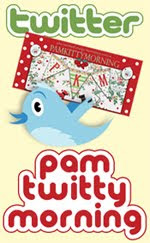 I love your sugar block Pam and I LOVE that you have that same fabric that my grandmother gave me! 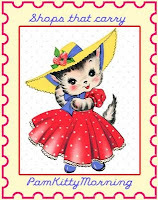 Thanks for participating in the Vintage Vibe blog tour! You're the best! My copy just arrived from Amazon! 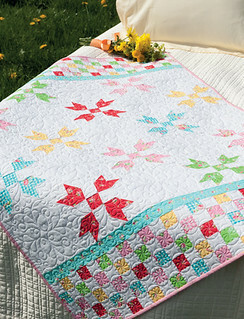 I love the Sugar quilt and her fun little stories. Your sugar block is very cute. Hi Pam! 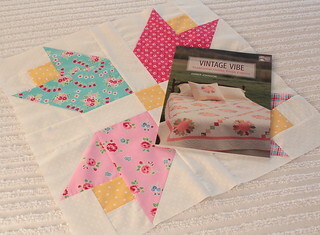 The book looks wonderful and your fabrics look great! 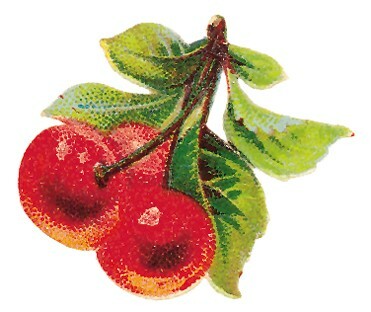 It's so fun how vintage looks timeless!! Oh I love the Sugar quilt you picked as your favourite. I also love flower Sugar fabric. I think it pairs really well with PKM fabric and have done so in a couple of quilts!